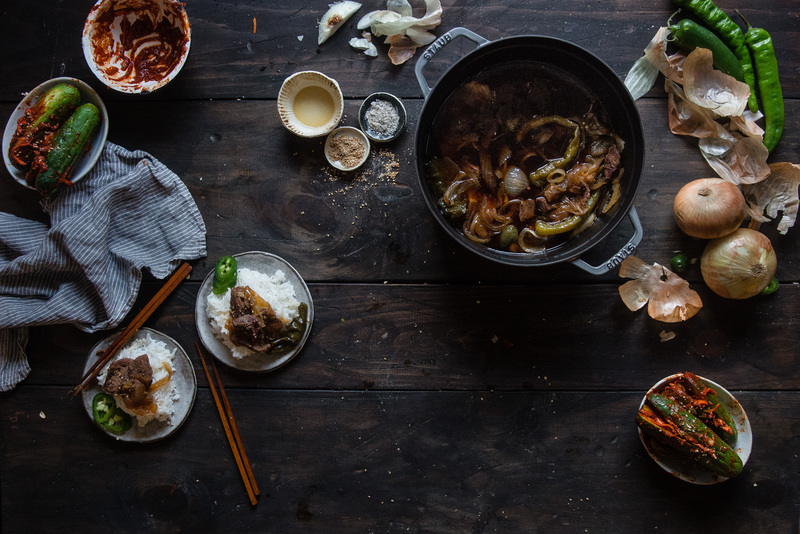 korean soy-braised beef (jangjorim) // a staub giveaway! Hi friends! How was your Thanksgiving? How are you faring back at work this week? We spent a slow and peaceful Thanksgiving here in Brooklyn, just us and dumplings (and ramen and musubis and pie), with snow and wintry mix drifting down outside our windows. Our work phones went off zero times, our butts stayed firmly on the couch, and I don’t think we stopped eating once after the first potstickers went on the (coffee) table at 4 PM. I’m so excited to see family over Christmas, but still, our tiny, cozy Thanksgiving was all I could have asked for. If you celebrated, how was your holiday? I’d love to hear all that you ate! Now that Thanksgiving is behind us, I’m bonkers-excited to transition to all things Christmas. We spent Advent Sunday goofy-dancing to Christmas music and setting up our Christmas decorations (and also working, boo). The steel-grey weather outside demanded comfort food, so I’ve had stews of all kinds simmering away. The Thanksgiving bird is a mystery to me, but slow-braised, Christmas-y stews are my jam — this Korean soy-braised one especially. Bowl #2’s mother taught me how to make it a few years ago and I’ve been obsessed ever since. It’s hearty, savory-sweet (of course) and intensely spicy, full of coarsely ground black pepper, bright green Korean chilis, sweet onions cooked down to soft, jam-like translucence, and chunks of meltingly tender flank steak. Best of all, after all the time and labor that went into cooking for Thanksgiving, it comes together with absolutely no fuss — just a bit of hands-off patience and a few hours of deliberately low-and-slow simmering. We had it alongside some aptly red-and-green cucumber kimchi (made from this recipe, throwback alert) and, befitting of the season, we ate until we were stuffed. Of course, a post about Christmas can’t end without some gift talk! Until I figure out how to send holiday cookies to everyone, I’m pairing up with the wonderful folks at Staub to give away my ideal present to one of you — a gorgeous 5.5 quart cast-iron cocotte, just like the one I used here (except in the color of your choice! And without beef in it.) 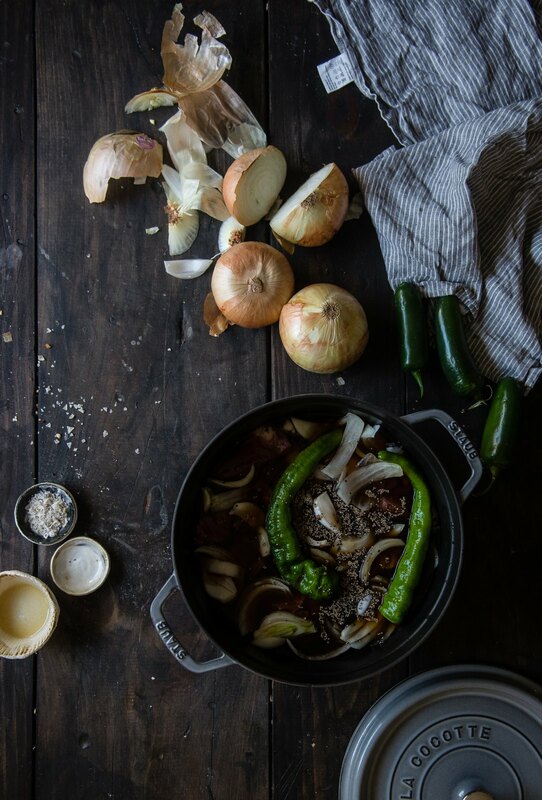 I’ve been dreaming of a sturdy, sleek Dutch oven like this one for longer than I can remember, and — after dancing around the entire apartment with it like a crazy person — I’ve been using it nonstop since the moment it graced our kitchen. On top of turning out perfectly-simmered stews, it’s boiled down cups of apple cider for caramels, heated sugar syrup for marshmallows, roasted chicken legs à la Jamie Oliver, and I have grand plans for a boule sometime soon. The cocotte has a comforting heft without being unmanageable, the lid has small (blunt) spikes that aid in self-basting your braised meats, and the seasoning is perfection — it cleans like magic and nothing sticks. For something I hyped in my mind for so long, it’s still managed to exceed all my expectations. I’m so excited it might find its way to one of your holiday tables too! To enter the giveaway, just use the widget below or leave a comment on this post about anything — your favorite thing about the holidays, your favorite holiday food, your ideal gift, something about this recipe, it’s all gravy. The giveaway is open to U.S. residents only (I’m sorry, international friends!) and ends next Tuesday, December 9 at 11:59 PM EST. The winner will be chosen at random and contacted by email. Happy holidays!! It took me a long time to learn this, but consistently (sometimes frustratingly) low heat and a long, long simmering time are key to tender braised beef. Something magical happens after the second hour, I swear. If you're in a rush, this is fine for serving after one hour, but it's incomparably good at two or three and only gets better with time. It also keeps wonderfully in the fridge for at least three to four days (plus the flavor will improve overnight) and will freeze for up to 3 months. 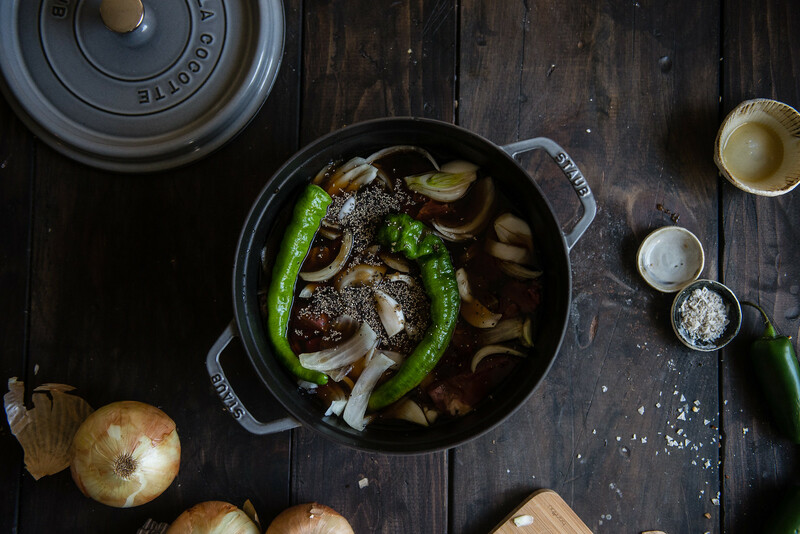 Place the cubed beef in a 4 or 5-quart Dutch oven or stockpot with the onion, Korean peppers, jalapeno, soy sauce, brown sugar, black pepper, and enough water to fully submerge the meat. Turn the heat to low and cover. Simmer on low heat only for at least two hours, but ideally three or more, or until meat falls apart easily when a fork is inserted. That's it! 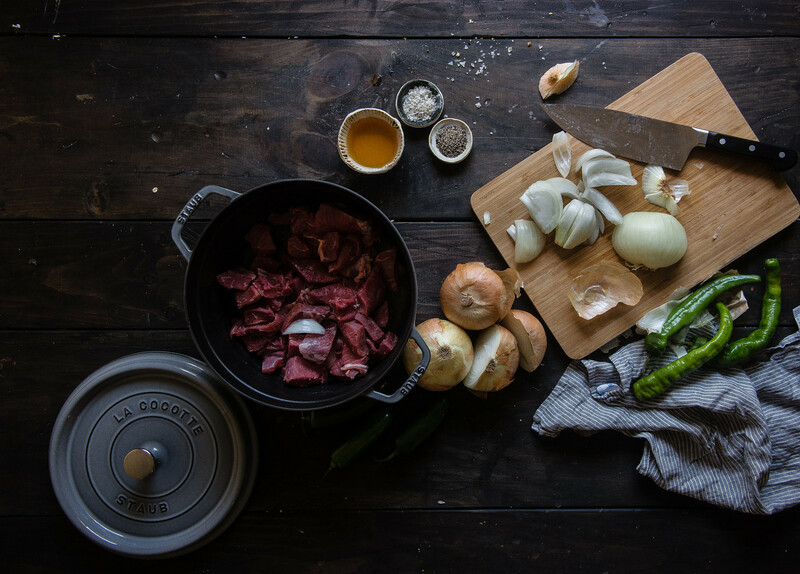 Many recipes call for parboiling the beef to remove impurities and adding the braising broth later -- I didn't see a huge difference in taste or quality by doing it all at once, so I omitted that step for simplicity's sake. Don't worry if the stew seems like it's taking forever to heat up or boil. The less it simmers, the better. If you want to shave a few minutes off the cooking time, you can start by heating it over medium heat for a few minutes, just until the liquid is almost hot but not boiling, then reduce to low heat. Korean gochu peppers are generally milder and sweeter than jalapenos. If you can't find them, Anaheim peppers would be a similar substitute; Italian long hot green peppers also work well. Alternatively, you could just use less jalapenos, one sliced and one or two whole. In addition, since it's hard to tell sometimes how spicy peppers will be, I generally start conservatively and add a few more slices of jalapeno or a few more peppers about halfway through cooking if it's too mild. On that note, I find that these stews tend to vary in how much seasoning they need each time I make them, so in any case, it might be a good idea to taste the braising liquid (not the beef) about an hour in, or when the meat is fully cooked but still tough. If bland, add more soy sauce and pepper; if too spicy, add a bit of sugar and remove peppers; if too salty, remove some broth and add water. Some versions of jangjorim add garlic or kombu for more flavor; you can do that if you like! Finally, you can also add a few eggs near the end, which soak up the stew flavor really nicely. To cook the eggs, add them (unshelled) to the pot about 15-20 minutes before the stew is done. Let simmer for 10 minutes, then remove and tap the shells with a knife or spoon to create cracks (like this post) and return to the broth until ready to serve. I love your blog. I can’t wait to try this recipe! My favorite part of the holidays is all the chances to cook for people! It’s a nice change from making stuff for myself most of the time; this way I can try new recipes meant for a crowd! I’ve long been a fan of your photography and recipes and get your posts by email. I can’t wait to try this one and would love to make it in a Staub cocotte one day! I’m Canadian, so keep my name outta yer darn giveaway. Also, we celebrated Thanksgiving in October. I’m still full. I LOVE jangjorim! In my family we typically have it as a side dish with a bunch of other dishes. I think it might be one of my favorite banchans that my mom makes. Now I have the most intense craving for some. I guess I’ll have to try making some on my own. I adore your blog. Fantastic recipes and recklessly good flavors. Your Thanksgiving sounds so perfect! Mine was big and crazy, so something small and relaxing sounds insanely nice. And jesh, this meal is beyond awesome,. Korean beef is my thing. PLUS I adore all Staub cookware. I have that same pot. It’s the best! I love this time of year. I love the cookie-baking and getting a chance to wrap up some of the goodies to share with family and friends. The holiday parties, the tree, the sense of goodwill…make this the best month of the year. I’d love to make this in a new Staub! I love this! I love Staub cookware – I have a Staub wok, and it works beautifully! Gorgeous photos Cynthia!! I would love to make a Lemon Custard. I would make black sesame flavored!! this stew is all i want right now. allll i want. My favorite food gift is a breakfast basket including a jar of my homemade jam with some sweet & salty granola. I honestly don’t know if the recipe or the photos are more beautiful. What a simple recipe that has wonderful results – I adore cooking meats slow and low – they come out well every time! This looks delicious and I can’t wait to try it. It reminds me of one of my favorites from SF’s Slanted Door restaurant. Lovely photography as always! Ooo, how lovely! I love the “togetherness”, the way everyone’s excited and happy – during the holidays. i love your blog! inspires me daily. I can’t tell what is prettier – the food & photography or the cocotte. Can’t wait to make this! This looks so yummy and you make it look so easy! Love your style. I ate too much, which, in turn, made my mom happy (why do moms think their children are too skinny?). It was a fabulous Thanksgiving. Love your scrumptious Asian take on the meal! I love Coquette’s! They’re a good for anything and everything. Try baking bread in them (I’ve got some in the oven right now) – it comes perfect every time. This dish sounds (and looks) incredible! My husband will be home a whole two weeks in a row around Christmas. Looking forward to it! When you figure out how to send everyone holiday cookies let me know 😉 This dish looks AMAZING. Mmm I want to try that recipe out! I’m not a big fan of beef, but this I would try. Perfect for the cold . I just recently had Korean food for the first time and I loved it and I’m so glad I saw your recipe because I’ve been meaning to try making it at home ever since I tried it. It’s so good and this looks amazing and of course if I had the Dutch oven tooke it in well as you said that would be gravy! Thank you for the opportunity to win this beautiful cast iron pot. Recently discovered your blog (last week) — so glad I did! Once my finals are over, I’ll be trying this recipe out with my family for sure! I just found your blog and love the posted recipes. I also enjoy the comments made regarding your recipes. As a chef that teaches culinary skills to home chefs, I have always wanted a piece of this cookware! Thanks for the chance to be selected! 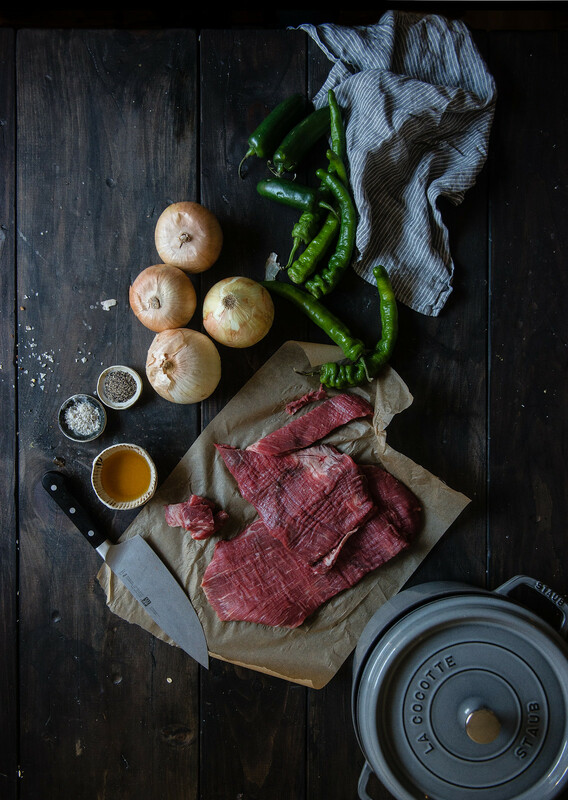 i had no idea you could cook flank steak like this!! i’ve only cooked it once and it was so tough that i haven’t bought it again. Love your food and photography! Always gorgeous! I want!! I would get it in the Sapphire Blue, to go with the gorgeous KitchenAid mixer that was a wedding gift, and that I may or may not pet every time I’m in the kitchen. Thanks for the awesome giveaway. the pot is gorgeous! Mmmm…Korean food is the BEST comfort food! This recipes looks awesome! My oma never showed me this recipe, I’ll have to make this for her sometime 🙂 Love the blog, and thanks for posting great stuff! This looks so warm & inviting, especially with your (always) beautiful photos. And your Thanksgiving sounds like it was truly lovely; the way, in my opinion, all Thanksgivings should be (rather than the rushing around & whatnot). I can’t wait to try this dish. We love long braised dishes to keep our kitchen cozy and our tummy warm. Love your blog! my favorite thing about the holidays is an excuse to go home and have my mom make me hot noodle soup. hey i could have used that pot to make my black bean chili today! You have no idea how much I love this, Cynthia!!!! Jangjorim is one of my mooooosssst favorite dishes in the world! It’s linked to so much love and great memories of my mom making it for me, and traditionally she makes it for my birthday. You’re seriously just as Korean as I AM, if not more. Hah! I’m impressed with this dish. I love your quiet dumpling Thanksgiving – sounds just perfect to me! We had quite the opposite with 15 friends and family around my parents’ table with all the traditional fixings – turkey, sweet potatoes, homemade cornbread stuffing, brussels, younameit. I wish I had some leftover dumplings right about now though. Or a pot of this braised beef. What a gorgeous dish, Cynthia. If Christmas looks like this, bring on the holiday dishes! Love the sound of your cozy Thansgiving, Christmas preparations, and this stew. What a stunner it is! Only one step (!!) and the result is a pot full of spicy, warming goodness. As always, the pictures are top-notch; the light adds a lovely feeling to these ones. Have the loveliest December, you two! Beautiful photos! Looking forward to making your dreamy Hokkaido Milk Toast. I love having specific recipes /dishes that I only make for the holidays – it makes them that much more special! Are Aneheim chili’s and the Goch comparable? They look alike to me. Your recipe sounds so good! One of my favorite Korean comfort foods! Damn. I MUST make this stew. Love the easy instructions and thank you so much for taking time to write out extensive notes! Btw, I passed the bar! Thank you for your words of encouragement along the way! I found your blog on instagram and I’m in love! Aside from the opportunity to return to our Midwestern home for a proper, snow-covered Christmas, the treat I’m looking forward to most this season is my mom’s brown sugar cinnamon kringle. Amazing. Been wanting to try something hearty and wintery for a while. I would love to own some Staub! Beautiful pieces. One of the dishes I brought to Thanksgiving (Friendsgiving) dinner was your garlic, chive and smoked Gouda brioche. It was a huge hit (no leftovers to take home, sadly). Thank you for all the kitchen inspiration and for making brioche doable–even for this novice bread baker! i haven’t been home with my (korean) family in a while, and i’d forgotten that jangjorim existed! so happy to see a recipe. That looks delicious! For thanksgiving, I made mochi ice cream (using your recipe), and it turned out great! We had a very simple and relaxing thanksgiving as well. This stew looks so yummy. This braise looks heavenly. Like you, I love the more free form holiday eating of the Christmas season, and this beautiful, warming recipe is spot on. And that laid back Thanksgiving weekend? Perfection. i am salivating right now. this looks like the ultimate chilly day comfort food. I want a dutch oven! days spent in pj’s with loved ones; i love everything about the holidays. Your photos are inspiring. Can’t get any better than wonderful rich winter stews. Loving the photos in this post. Absolutely stunning! My favorite part of Thanksgiving is definitely all of the cooking that leads up to it. Sounds like you had a great holiday! This recipe looks absolutely delicious. My family is really getting into Asian cooking, but I’ve never seen these Korean chili’s before. So this will be a good reason to venture down to our local Asian market to see if I can find them. This is my first time here, but know that I will be back. And it would be wonderful to cook this in one of those Staub pans. 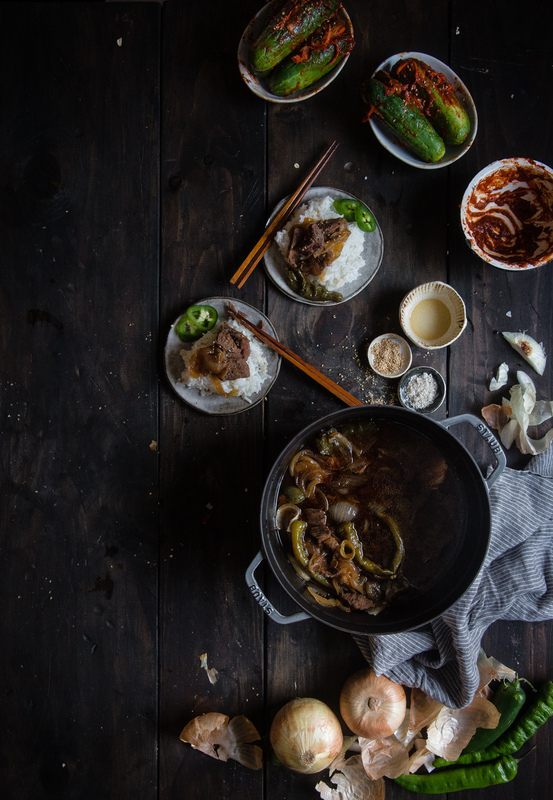 I would love to try this and make it for my sister- who lived in Seoul for a year and misses the food terribly! This recipe looks wonderful! And that pot, too gorgeous, love the color. Happy Friday! This could be the first of many Korean recipes I make – It looks so good! I love this recipe. I’m half Korean and this just reminds me of growing up and going to my Grandma’s house. This is such a comfort food for me. Ate it growing up and it’s perfect with just some rice and hard boiled eggs. This looks amazing! 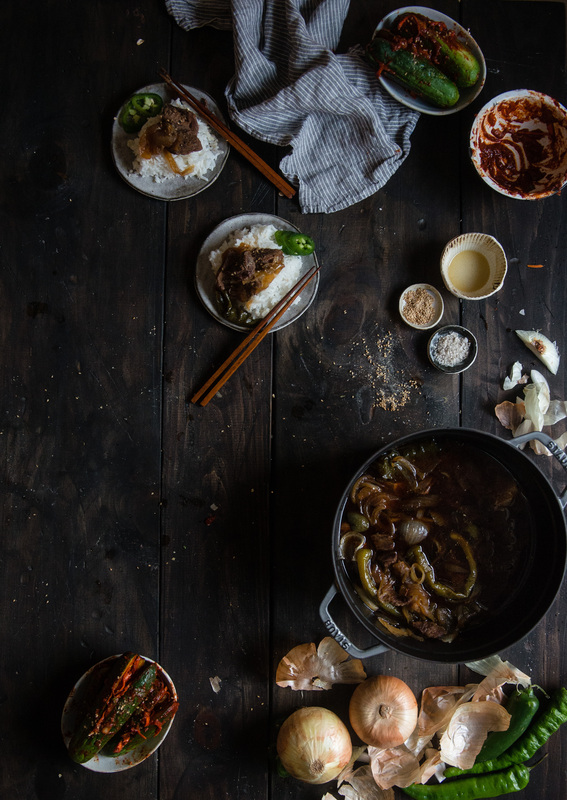 I lived near Seoul for a couple of years and it changed the way I eat forever. If it doesn’t taste good, I pour some kojuchang on it. Your photos are stunning! wait this looks SO easy. need. That Staub is gorgeous!! And those flavors – bring on the beef ;). I love your blog! I also love poke from Foodland just like you! This has been said before, but gorgeous photography! Yay! This is so perfect. I love that you spent Thanksgiving just the two of you. Secretly I wanted to do that too (shh, don’t tell my family!) – but instead I will have to settle for a nice night in together – us and this super yummy looking braised beef. It is seriously making my mouth water just looking at it. I love it. Perfectly done, as usual, Cynthia! ps- that Staub?! Ummm…yes. Always yes. While I’m craving stew now, because of your post, I’m going to proceed with my planned post-Thanksgiving turkey pho. But this braised beef is next on my list! Best part about Thanksgiving was my roomate’s Grandma’s short ribs. I love all the traditions! I love holiday desserts. Cheesecakes, pies, cakes, cookies… you name it! Thank you so much for the giveaway. I am happiest when cooking and baking in my kitchen, and beautiful cookware makes it all that more pleasing! This Staub cocotte is so pretty! Wow! Looks Yummy! My favorite thing about the holiday is always the food and coming together with the family and enjoying a good meal. This looks like a wonderful recipe that I will have to try out this week. looking forward to making this with my best friend when we’re both back from college for the holidays! we always find time to cook together, and this is the best kind of comfort food – thank you! hello. I think I can smell this. And it smells wonderful. When they invent scratch and sniff for the Interwebs I’m never leaving your site. I will just hang around, pretending you’ve invited me over. Fudge is my favorite during the holidays. I’ve been wanting to try making the artisan in 5 bread loaves and this Staub looks perfect for that! I guess there are about a thousand things I’d like to cook. I love the holidays because it’s a great time to reconnect with loved ones and spoil them rotten! Looks delicious – and a perfect winter dish to keep warm! Cheese! My holiday is full of cheese on cheese on cheese! I’m most excited to be on holiday because finals will be done and I can resume cooking! I’m new to your blog and love it! So many good ideas! This dish is just the size I’m looking for, so I will cross my fingers! I made this tonight for my family. It was gobbled up. I had to add about another cup of water, so added a bit more soy sauce and brown sugar. I didn’t get my stew to reach a simmer for almost two whole hours, so it took a long long time to cook. But the stew is delicious! I will definitely be making this again. Thanks for all your recipes, I will be sure to try more. i grew up always eating this shredded with other banchans (side dishes). also awesome with jook (congee) – the bland with that little bit of saltiness. and my mom always put in a chunk of ginger when cooking bc she said it made it smell less “beefy”. haha. Can I use some of these photos to promote a non-profit film series on food and film? Hi Cynthia! I’ve enjoyed your blog for awhile and just wanted to drop a note to say congrats on the adorable little one and a very belated thanks for this recipe! I actually started making it almost a couple years ago when I was pregnant and looking for beef dishes with fully cooked meat, haha. We’ve enjoyed it many times since then! Sometimes I toss in tofu and yam noodles for a sukiyaki-ish switch up. Thanks again, and enjoy these early sweet days with your baby!